Playing card recognition systems can be coupled with a robotic system which acts like a dealer or a human player in a card game, such as blackjack. Implementing this kind of application is also a good example for learning computer vision and pattern recognition. This article involves binarization, edge detection, affine transformation, blob processing, and template matching algorithms which are implemented in AForge .NET Framework. Note that this article and this system is based on Anglo-American card decks, it may not work for other card decks. However, this article describes basic methods for detection and recognition of cards. Therefore, recognition algorithm might be changed according to features of the deck that is used. Here’s a quick video demonstration. 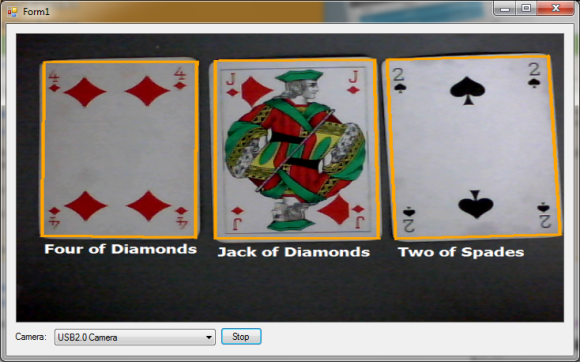 We need to detect card objects on image so that we can proceed with recognition. For detection, we apply some image filters on image for helping detection. First step, we apply grayscaling on image. Grayscaling is a process that converts a colored image to an 8 bit image. We need to convert colored image to grayscale image so that we can apply binarization on image. After we convert colored image to grayscale image, we apply binarization on image. Binarization(thresholding) is the process of converting a grayscale image to black & white image. In this article, Otsu’s method is used for global thresholding. Since we have binary image, we can proceed with blob processing for detecting cards in image. For blob processing, we use AForge.Net BlobCounter class.The class counts and extracts standalone objects in images using connected components labeling algorithm. After executing the code above, BlobCounter class filters (removes) blobs whose width or height that isn’t between [150,350] pixels. 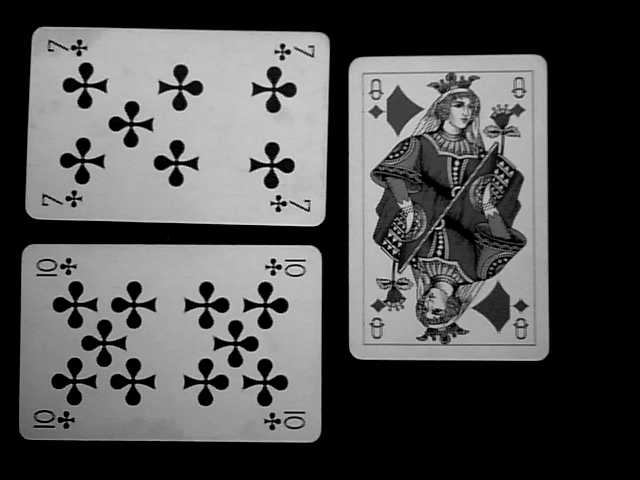 This helps us discriminate cards from other objects(if there’s any) in image. These filter values can be changed according to the test environment. Suppose that, if distance between ground and camera is bigger, then cards will be smaller in image. In that case, we shall change min, max width & height values. Now, we can get information (edge points, rectangles, center point, area, fullness, …etc.) of all blobs by callingextractor.GetObjectsInformation(). However, we only need edge points of blob to find corner points of rectangle. For finding corner points, we invoke PointsCloud.FindQuadriteralCorners function with list of edge points.